I don't smoke but I am still concerned. Tobacco Act does not go well with our country's image. And most importantly it doesn't represent the will of people, which it should have. Everybody is talking about it now and many are swearing on the government. But I wonder who is more concern about Bhutan than our Prime Minister. He sounded upset about the Facebook group and many comments people made, and he has the right to be. What he wants is not silence but the right approach. He wants people to talk to their representatives. While it is possible to do that, it could be difficult to reach them. Here is a easier way out! Sign the online Petition: Repeal the Tobacco Act. Read the letter, and if you agree then give your name and email address and click on sign. Comment is not necessary but if you have something to say make it formal and decent since it is going to be submitted to the government. This is the right and peaceful way and there is nothing to worry about. Form will look like this! I have signed, You? Don't you mean revise or amend and NOT repeal? Yeshey, I think the forerunner wants to "repeal", I am just calling out to people...it all started out from the Facebook group. There are talks about want "amend" rather than "repeal" ...lets see what comes out! What you think will be best? Have your signed the petition yet? No I have not yet signed the Petition and I will not sign it if it is for repeal. I will sign it if it calls for amendment. @ Yeshey, I got your point. While the title can't be changed (It may be done while printing the final copy before submitting) in the online petition, there are major changes made on the letter. 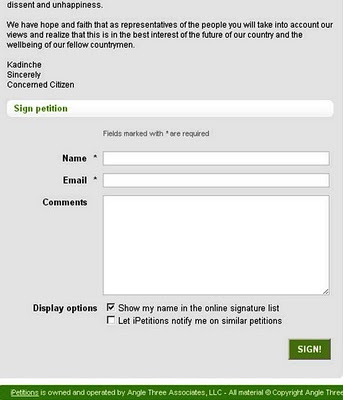 After reading the following lines (I copied from the actual petition) I hope you will sign. iv)Free all those that have been imprisoned and remove any criminal records that may be against their names." and Finally Bhutan's state religion is Buddhism and not guruism. Buddha advised us to avoid drinking because it is the cause of all three evils. I liked your point of view though! Dasho Yeshey, please sign sa wai! It says either/or. @ Passang, thank you for all your support. In my opinion you are a genuinely concerned citizen of Bhutan! Sorry, unless that title is changed to AMMEND, I will not sign because I am in agreement with the principles based on which the ban is necessitated. It is my belief that those who chose to oppose the ban and seek to repeal it have rather limited understanding of the principles of harm, the law of morality and the merits of paternalism. If you are discussing the enforceability of the law, there too I will join you. But certainly, where the question of the need of the law is concerned, the law makers get my vote. You may like to know that I am actually in the process of writing a paper on the issue - but I am constrained for time - as you can see, I am posting this around 4.50 AM. I am up early because I am headed for Zhemgang in a while. If it is a question of upholding and protecting the rights of the individual, you still need to understand that it must not come at the cost of others. When your rights come at the cost of others, that right becomes a menace. There also seems to be complete misunderstanding with regard to the question of the severity of the punishment prescribed by the Act. I have given it some thought and I have realized that if a punishment is weak enough not to deter the wrong doers, there is no point to the punishment. Hi although I do not live in your country I can see that the situation is quite complex. We have a lot of freedoms to use alcohol and tobacco here in america but the situation is tricky. These substances are very addictive and just threatening people with arrest is ineffective for ending it's destructive effect on our people. (see our daily, hideously expensive "War on Drugs") I think awareness, treatment and compassion is a good start to the elimination of Tobbacco. It does kill tons of people and cost so much in terms of medical monies. Tobacco use is especially driven by addiction. Perhaps melding drug treatment with some Buddhist methods on eliminating craving could be of help .You all have access to a rich tradition full of methods of training the mind, those can be put to use to help free people from addiction! Shaming and criminalizing addictive behavior does not seem to work too well here, it only drives it underground and puts it in the hands of criminals and folks motivated by greed. To contradict PaSsu, I do laud your country for taking a stand against this terrible drug and having the government involved can be a blessing as long as it can provide a vision of a land not driven by craving not just punishment and fear. 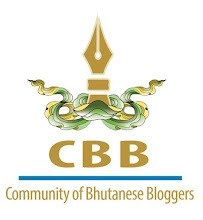 Hitting Century on my blog amidst Crisis! My Daughter got her ears pierced!